Traditionally, the final fill operation included stainless steel equipment connected via reusable valves, rigid tubing and steel pipes. Today, many process engineers are designing this operation with single-use transfer lines in place of stainless steel equipment to reduce sterilization time and cost. 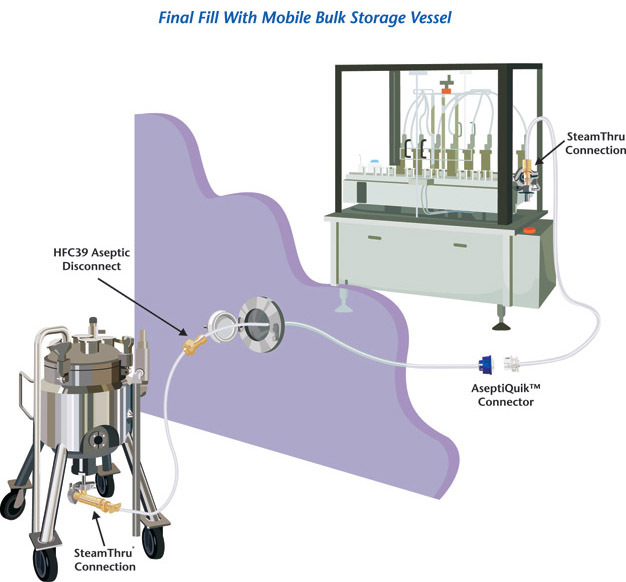 Final fill tanks are designed to transfer formulated product from formulation suites to storage areas and ultimately to filling suites. To allow sterile connection to and from these vessels, designers traditionally added three-way valve assemblies to fill and drain ports. Replacing these heavy assemblies with single-use transfer lines and connectors eliminates cleaning validation and maintenance while reducing mobile vessel weight by tens of kilograms. Single-use transfer lines can be attached before vessel SIP sterilization with Steam-Thru Connections (used as either steam access or condensate drainage sites) or can be steamed separately before fluid transfer. For vessel outlet, combining a number of single-use components into the transfer line can create a robust system to ensure product safety. For example, outlet transfer lines could incorporate a single-use Steam-Thru Connector to attach to the sterile holding tank. In this case, a “through-the-wall” fluid transfer system brings a portion of the transfer line into an isolator where filling occurs. Next, a quick-connect HFC39 fitting or AseptiQuik Connector attaches the transfer line to the filling machine. Finally, transfer lines using a valved HFC39 quick-disconnect coupling aseptically disconnect the processor from the filling equipment.